Need rapid, accurate and relevant viscosity analysis of your sample. Need verification of material supplied to you or you need to provide a verification of your material to your customers. Need to investigate unexpected changes on batches of material. Are looking to purchase viscometers or rheometers and need to establish the correct equipment, accessories and test methods. All viscosity testing services come with a comprehensive report with detailed observations, backed up with friendly, accessible support and Q&A/follow ups. Our purpose is to enable you to identify the best testing approach for your products and to make full use of the results we provide. The vast majority of samples we receive are non-Newtonian fluids – that is, their viscosity is not a fixed value but is dependent upon the degree of shear they are exposed to. For these shear-dependent products measuring viscosity at a single shear rate only provides a tiny glimpse of the “full picture” – instead a “flow curve” of viscosity across a range of shear conditions is far more meaningful, from which a viscosity value at a shear condition relevant to the process or product usage conditions can be read. Shear rate, shear stress, temperature, sample size and even the container holding the sample can all impact the viscosity of your material. We use a variety of set-ups for such testing, including cone/plate, plate/plate or coquette/concentric cylinders. Our approach enables accurate correlation and comparison of viscosity measurements, performed under controlled conditions, across a wide range of equipment. Controlled Rate Viscosity Profiles are a great way of understanding product behaviour under “forced-flow” conditions such as in pumping, mixing or filling processes. Samples are subjected to a range of shear rates and viscosity is measured throughout. Controlled Stress Viscosity Profiles are excellent for simulating the altogether more gentle situations where gravity, surface tension and capillary forces provide the driving force behind the flow process such as draining or long-term storage. 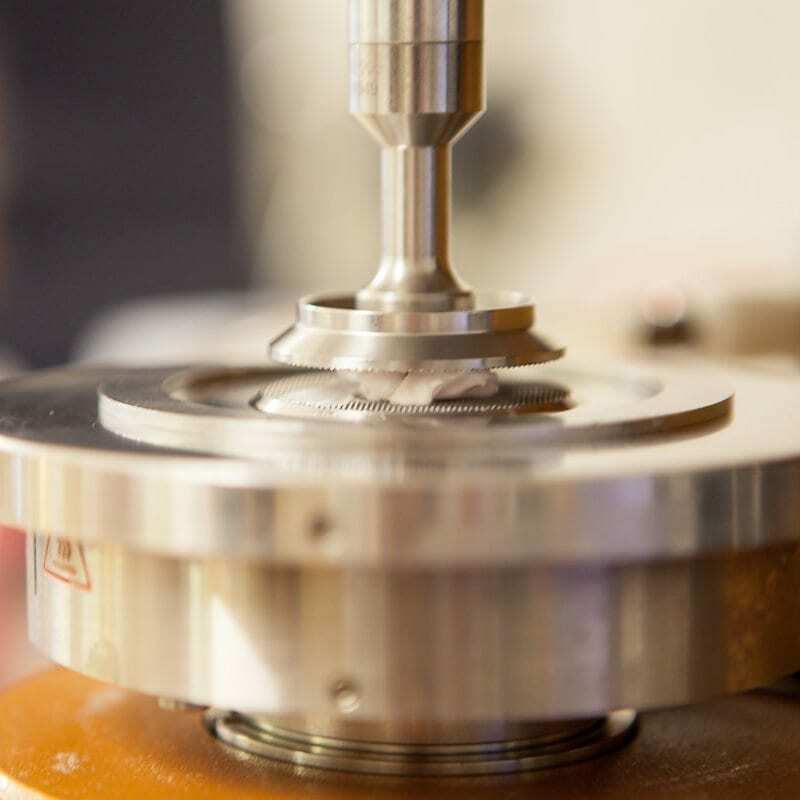 Controlled stress testing also enables the measurement of zero-shear viscosity, a plateau viscosity obtained at very low shear. This can be useful for predicting emulsion or suspension stability. Viscosity / Temperature Profiling: In addition to performing the above methods at discrete temperatures we can also provide viscosity, at a single shear rate, across a continuous range of temperatures. All our viscosity test measurements can be supplied with instrument calibration verification to certified, traceable viscosity standards. Ask us what viscosity test method best suits your needs. Brookfield viscosity is the general term for a measurement derived from tests performed on Brookfield viscometers. If you have recently acquired a Brookfield, or developed a new product and are in need of developing a standardised test method, we can identify the relevant spindles, speeds and measuring conditions, as well as perform the testing and provide you with viscosity in centipoise (cP or cps) or milliPascal seconds (mPa.s) at your defined temperature. Read more about Brookfield viscosity testing and our Brookfield viscosity test method development services. For worked examples for all tests, please use our search tool below or check out our Articles and Case Studies section. Hacking the rheology of your competitors’ products…before they hack yours.